Stem: erect, 15--80 cm, branches ascending, tan, distally glabrous or thinly hairy. Leaf: basal petioled; cauline 0.2--3.5 cm, lanceolate, entire, reduced distally on stem to awl-shaped bracts, glandless, glabrous or sparsely hairy. Inflorescence: involucre 4--8 mm, narrowly obconic or fusiform; phyllaries lanceolate, cobwebby tomentose; tips erect or slightly spreading, +- purple tinged. Flower: (3)8--18; corolla funnel-shaped, pink to lavender, tube darker; style branch appendage 0.1--0.3 mm, short-triangular, abruptly pointed. 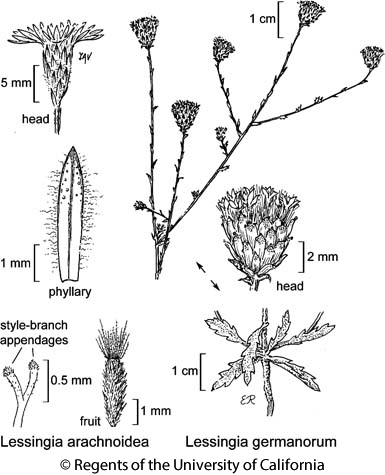 Fruit: 2--3 mm; pappus generally < fruit, occasionally a crown (>= fruit, Sonoma Co.), white or +- tan-white. Citation for this treatment: Staci Markos 2012, Lessingia arachnoidea, in Jepson Flora Project (eds.) Jepson eFlora, http://ucjeps.berkeley.edu/eflora/eflora_display.php?tid=76341, accessed on April 23, 2019. SnFrB (near Crystal Springs Reservoir, San Mateo Co.; near Camp Meeker, Sonoma Co.). Markers link to CCH specimen records. Yellow markers indicate records that may provide evidence for eFlora range revision or may have georeferencing or identification issues. Purple markers indicate specimens collected from a garden, greenhouse, or other non-wild location.